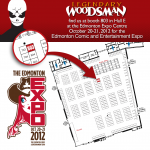 We are excited to announce that we will be at the Edmonton Comics & Entertainment Expo on October 20-21, 2012 at the Edmonton Expo Centre in Edmonton, Alberta (our home town). You can meet the Dynamic Duo of Adam West and Burt Ward (TV’s Batman and Robin), the effervescent Nichelle Nichols (the original Lt. Uhura of TV’s Star Trek fame), as well as some people who worked with Joss Whedon! Joss is a big deal now, I hope you know. We’ve requested to be placed in the webcomics section and have been assigned table 803, the table adjacent to Sam and Fuzzy and Weregeek. Personally, I’m really excited about this convention because with it comes the hope that it will grow into something as large as the Calgary Expo. All those years that I’ve felt envious of the residents of San Diego or New York or Chicago or Seattle (or Toronto) for having a big convention in their city… perhaps this convention will be my major local con (instead of Calgary, Edmonton’s bane). We know you’ll be exploring the Expo floor, but here’s a handy map to help you find us.